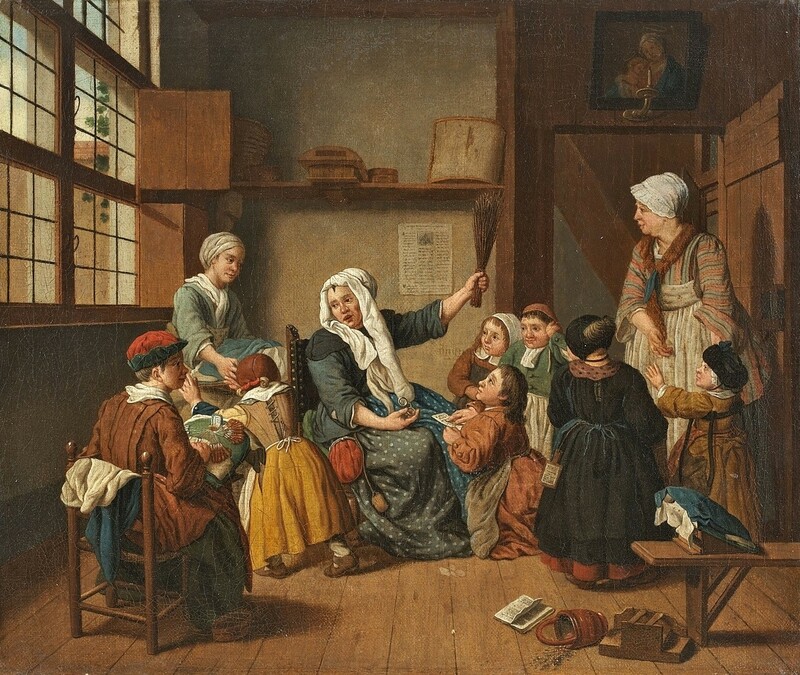 18th century school for girls. A painting by Jan Josef Horemans (1682 – 1759). It’s often said girls of the middling sort in the eighteenth century were given little or no formal education. That seems to be contradicted by this advertisement from a Norwich newspaper of 1782. I’m delighted to see the emphasis on English grammar! We could do with that today. Also note that the girls are to be taught arithmetic. C. TOOKE, from Mrs WILLIAM’s Ladies Boarding School, near London, has taken genteel Apartments at Mr ROBERTSON’s, opposite the White Lion Lane, Norwich, where she opened on Wednesday last, January 2, 1782, a Day School for teaching young Ladies English grammatically, and all Kinds of Fancy’d [sic] Works, Writing and Arithmetic, on the following Terms per Quarter: Fancy’d Works and reading – 10 shillings 6 pence , Plain ditto ditto – 7 shillings and 6 pence. Writing and Figures, with Pens and Ink included – 10 shillings 6 pence. Firing – 1 shilling. N.B. No Entrance required except for the Paper Work, and that is Five Shillings, and Half a Guinea per Quarter. (Norfolk Chronicle, January, 1782). It’s interesting that this curriculum included writing as well as reading. However, the fees charged would have been fairly substantial at the time, so the pupils must have come from the children of reasonably prosperous artisans, shopkeepers and merchants. There was obviously a demand for this type of teaching, as witness this advertisement placed in the Norfolk Chronicle for June, 1793. WANTED IMMEDIATELY — A SINGLE WOMAN, who well understands NEEDLE-WORK, and will undertake the management of teaching 15 or 20 girls, in a pleasant situation near [Great] Yarmouth. — Such a person with a good character  on application to Mr Downes, bookseller, Yarmouth, will be treated with on equitable terms. It’s not immediately clear whether Mr Downes was the person running the school, or associated with such a person, or whether his shop was just being used in place of a modern-day box number. PS I’m afraid posting will be less frequent over the next few months. I am working hard on final edits and proofreading for the next book in my “Ashmole Foxe” series of mysteries – and will then move on to the next “Adam Bascom” one. Blogging will have to take a back seat for a little while. Clearly the poor needed their children to work, but those that could afford it recognized the value of educating women! Great information. Thanks for posting. The education of girls continues to be a struggle in today’s world. I found it interesting that some 18th-century schools and parents at least recognised the need to educate daughters as well as sons. Amazing that’s not true today in the whole of the world. I always think that could have been me!